Hotel Armonia, Pisa. Armonia Hotel Pisa. The Hotel Armonia is a splendid structure, provided with every service and comfort that will make your stay in Pisa a unique and unforgettable experience, whether you come for business or for a pleasure trip. The structure was built in 1860, it received during the years important people and is able to offer you a long experience. You can enjoy 27 rooms, characterised by very elegant furniture. Among these 4 Suites stand out, equipped with a double bathroom and Jacuzzi, which can also become two large apartments, according to your needs. 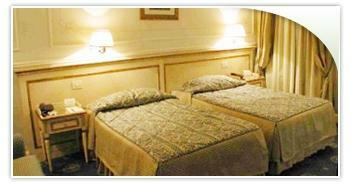 Moreover, the structure has at its disposal communicating, triple and non smoking rooms. On the ground floor we have rooms, which can receive disabled persons. It's not all: on the ground floor you find two halls that can receive up to twenty persons - perfect for business appointments or meetings, and another hall, located on the third floor, which can receive up to 80 guests. A big comfort is guaranteed by the use of our card, which allows you the automatic reactivation of lights, each time you enter your room. From May 1st, 2012, the City of Pontedera will introduce a new City Tax (City Council Resolution Nr. 17 dated March 27th, 2012). The fee will be applied only on visitors staying overnight; It will be applied maximum up to 5 consecutive overnights and will not be applied to: 1. Children up to 10 years old; 2. Persons with disabilities - by proper medical certification - and just one of their carers; 3. Carers of people hospitalized in Pontedera - just one per patient. There will be a 50% reduction of this fee for: 1. Children between 10 and 18 years old; 2. People over 65 years old. City Tax will amount just € 2,00 per person per night.